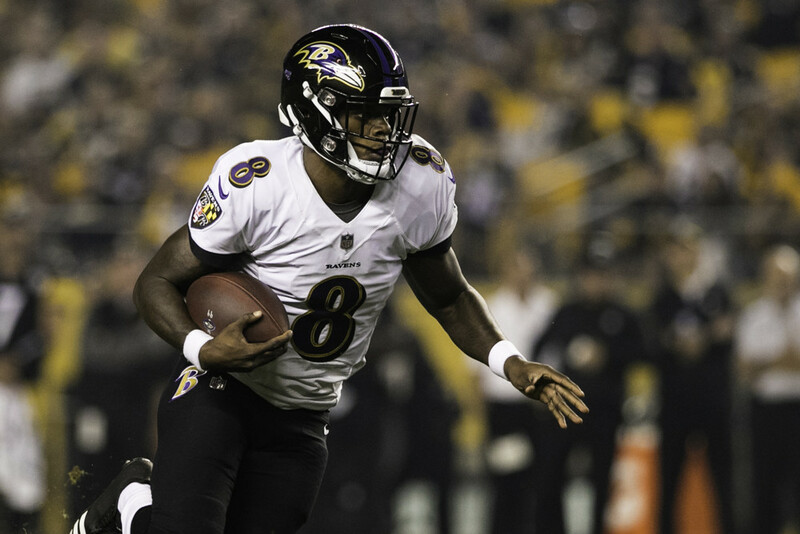 With Joe Flacco ruled out for Week 12, Lamar Jackson will get his second start this Sunday against the Oakland Raiders. And while rushing 27 times isn't sustainable in the long term, it's perfectly acceptable on a week to week FanDuel basis. Even with the rushing, the limited offensive game plan puts a ceiling on his fantasy projection, but the awful Oakland defense is the best possible matchup for Jackson. Expect less rushing but a higher passing total and a couple big plays to fuel a top 5 QB score. With a bum ankle seemingly healed, Matt Breida put up his second 100 yard rushing performance in Week 10 against the New York Giants. Add on a much needed bye in Week 11, and he looks fully ready to take advantage of a Tampa Bay team that is giving up the 5th most points to fantasy backfields and quit on Dirk Koetter a couple weeks ago. Random aside, I can't believe that they beat the Saints in Week 1. Crazy. Anyway, Breida is averaging over 16 touches per game the last three weeks and looks in line for another healthy output, he's a good RB2 option. Your running back flier of choice in Week 12 is Elijah McGuire of the New York Jets. McGuire has stepped in to take the majority of Bilal Powell's snaps giving him a decent floor. Isaiah Crowell still exists and will vulture the goal line carries, but is still rarely used on pass downs and has seen his snap count decline each of the last 3 games. The Patriots are average against the run but their linebackers struggle to cover running backs in coverage, and the Jets aren't known for pushing the ball too far down the field. It's a definite what the heck play, but the Jets are in full tank mode and will likely give McGuire plenty of chances to prove himself. Quiet for most of the season, DJ Moore blew up in week 11 against the Lions, catching 7 balls for 157 yards and a touchdown. Given his inconsistencies, it's not a great idea to predict another massive week, but with Devin Funchess out, there will be ample targets coming his way. The Seahawks have given up over 40 points per game to wide receivers over their last four contests meaning the upside is available. Moore's lack of production before last week makes him a risky choice, but the high volume of targets and weak secondary make him worth a gamble. With Demaryius Thomas gone, Courtland Sutton has shored up the number two wide receiver spot in Denver. It's not an overly lucrative position with Case Keenum under-handing the ball, but Sutton, averaging an outrageous 20 yards per catch, knows how to do a lot with a little. A week after tying Emmanuel Sanders in targets, Sutton looks to at least be getting enough looks to warrant a look in FanDuel. Anyone in this price range is going to be inherently risky, but with Denver likely playing from behind, Sutton should see enough deep balls to put up a decent stat line. I was also considering Cameron Brate here with his bargain basement $4,400 price and the lack of OJ Howard, but the 49ers have been very good against tight ends. The Bengals have been the exact opposite, giving up the third most points to the position. Despite his low output, David Njoku has been heavily involved in the Browns offense, running large volume of routes even if they haven't translated to catches in two of the past three weeks. Look for that to self correct against Cincinnati.